Helping small business start, grow, and succeed! Imagine that your business was struggling to make ends meet and decided to call in a well recommended business expert to turn things around. Now imagine that this person showed up and told you to fire the majority of your staff, ignore your family time, and dedicate your entire life’s effort to your business. Cloutier has clout to back up his philosophy, saving countless companies from the brink of bankruptcy and from his work as a lecturer, coach, and sought after commentator on every major business TV program in America. Credentials aside, I must stop here and make a confession; I first listened to portions of this book in an audio format and nearly threw it out the of my car window. Cloutier starts his book with a flourish of “tough questions” that sets the tone for his preachy, in-your face rhetoric. Like an old-school football coach, Cloutier sounds the wakeup call that many are not receptive to hearing. Profit Rule 4: “Love your business more than your family” will be a deal breaker for many. Cloutier’s summary sounds like he’s never lived in a world where both spouses work and someone has to nurture, love, and pick up the kids after school. Yet the following passage from the book actually states: “If you’re not focused – if family, friends, community, and church fill up your busy schedule – you are probably failing to deliver real profits for your company”. Get the picture? Profit Rule 10: “You are not in business to pay your vendors”. The strategies in this chapter detail ways to delay payment to your suppliers and actually states: “Your vendors are your best source of interest-free financing. “ It’s clear that the author never lived in a smaller community where the payment withheld from local business vendor might also be the salary of one’s friend or neighbor. “Profits aren’t everything, they’re the only thing” does contain great summaries and sound strategies on crucial topics such as the importance of cash flow (minus the slow vendor payment concept), managing a sales force, and dealing with tenuous family business issues. In many ways, Cloutier’s readings truly shine, offering advice that can be utilized by any small business. The book also offers insight into the mind of a hyper-competitive business owner who possesses a “take no prisoners” attitude that can ultimately reap huge financial gain. But, this no-compromise mantra also comes with the high cost of alienating one’s family, friends, employees, suppliers, and community. I’d challenge Cloutier with the evidence of many financially successful business organizations that strike a balance between financial success and “having a life”. The problem with “Profits aren’t everything, they’re the only thing” is that Cloutier does not allow for any middle ground. His steadfast “It’s my way or the highway” rules harkens back to a time when there was a clear and wide divide between management and employees. Today’s workforce is more engaged with small business success and clearly doesn’t deserve to be treated as interchangeable parts. Regardless of one’s own philosophy of the owner/employee relationship, today’s bookselling world seems to be enthralled with absolutes and polarizing controversy. If that’s the case then “Profits aren’t everything, they’re the only thing” clearly delivers on both counts. For small business owners, what venture capitalists call “sweat equity” is no more than working for nothing and being a fool. Money talks. Show who’s the boss by paying yourself as one. There is no $ in team, just mediocrity and excuses. Don’t encourage diverse opinions. It’s a business, not a democracy. Let your competition play golf while you stay in the office and steal all of their business. No real business gets done at a trade show. It’s a flimsy excuse for a paid vacation. Chapter 11 takes time, hard work, and sacrifice, but you’ll come out stronger. 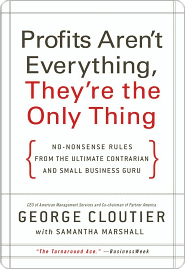 This entry was posted in Partner Resources and tagged “Profits aren’t everything, Book reveiw, george cloutier, they’re the only thing". Bookmark the permalink. Click here to see your small business funding sources.